Geckos are small- to medium-sized lizards classified under the reptile family Gekkonidae. These colorful, nimble little reptiles are well known for their ability to effortlessly scamper up vertical surfaces and walk upside down underneath tree branches or across ceilings. More than 2,000 gecko species inhabit temperate and tropical regions on every continent except Antarctica, where they hunt, climb, burrow and, of course, reproduce. Most geckos are oviparous, meaning they reproduce by laying eggs. Females generally lay one or two eggs in a clutch. Most species reproduce once per year, although some like the leopard or tokay gecko may produce four to six clutches per year. Females deposit their eggs in protected locations under rocks, logs or tree bark. The eggs are white, sticky and have soft, pliable shells that quickly harden once they're exposed to air. Depending on the species, the eggs incubate for 30 to 80 days before the fully formed baby geckos emerge. A small number of gecko species are ovoviviparous, meaning they produce live young. Live-bearing geckos are classified in the subfamily Diplodactylinae. 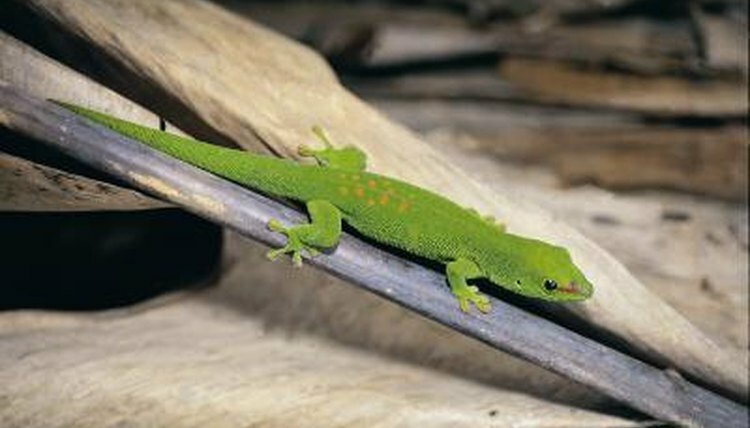 Endemic to New Zealand and New Caledonia, they include the jewelled gecko, Auckland green gecko, cloudy gecko and goldstripe gecko. Ovoviviparous females typically reproduce once per year, giving birth to twins during the summer months. Mating habits vary among gecko species, but most include some type of courtship ritual. These rituals may include posturing, movements, vocalizations, and even physical nipping and nudging. For example, the male leopard gecko courts his intended by vibrating or waving his tail, scent marking and nipping at the base of her tail. Mediterranean house geckos emit a series of clicking sounds to engage females, and tokay geckos -- actually named after the male's mating call -- repeat a loud "to-kay" sound to attract mates. The phenomenon of parthenogenesis allows for female geckos to reproduce without mating. Parthenogenetic geckos are all-female lines that reproduce clonally, meaning all offspring are genetic duplicates of their mother. These species are believed to have evolved when two different species hybridized (crossed). Two examples of parthenogenetic geckos are the mourning gecko and Australian Bynoe’s gecko. Parental care among geckos is limited, if it exists at all. Aside from carefully concealing their future progeny, oviparous females deposit their eggs, go on with their lives and never look back, unless it's to consume their own eggs, which happens on occasion. Ovoviviparous females don't exactly dote on their young, but they do appear to tolerate the presence of their offspring for long periods of time, thereby offering them some form of protection by their mere presence.